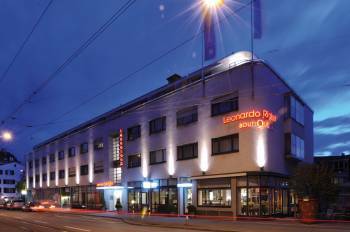 The 4-star Leonardo Boutique Hotel Rigihof Zurich welcomes its guests in the heart of Zurich’s elegant University district, just a 10 minute walk from the Central Station and the famous Bahnhofstrasse. The ideal location makes the Leonardo Boutique Hotel Rigihof Zurich a unique highlight for lovers of architecture, tourists and business travellers alike. It offers 67 rooms with elegant design and free Wi-Fi, a restaurant, a stylish bar and many other services. Furthermore, the meeting room Eileen Gray for up to 30 persons is equipped with modern technology and offers the perfect ambience for meetings and seminars.